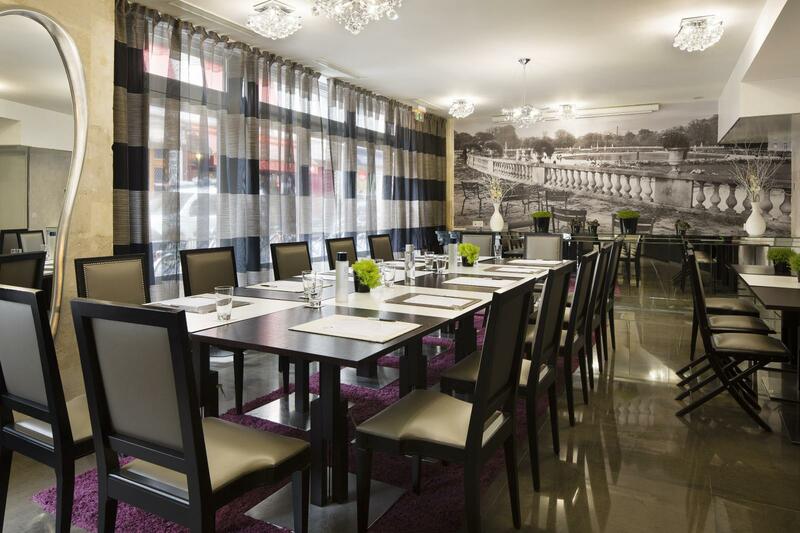 To facilitate your business meetings and conferences in Paris, opt for a luxury room conveniently located on the Left Bank in a district offering numerous opportunities for pleasant lunches. The Grand Hotel Saint-Michel can provide you with a perfectly equipped space in which to welcome your employees or colleagues. Organise your business events with confidence! 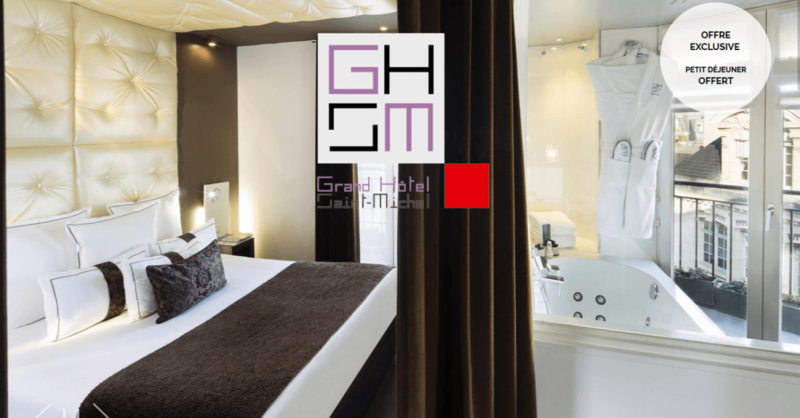 The Grand Hotel Saint-Michel is located in the historic and central district of the 5th arrondissement, on the Left Bank of the Seine. With its various centres of higher learning, splendid monuments and picturesque parks, this is one of the most popular districts in the capital. Very easily accessible, it’s served by various modes of public transport for the convenience of you and your colleagues, whether you choose to travel by Metro, bus or RER. There is also a number of taxi hire options in the area. Located between the banks of the Seine and the Jardin du Luxembourg, the neighbourhood offers a wide range of possibilities in terms of catering, so you can take a break during your event or unwind afterwards. We place at your disposal a comfortable and well-designed professional space of 40 square metres. The room is bright, and allows in plenty of natural light, helping you and your colleagues to remain focussed even after hours of intense work. The WiFi connectivity is reliable and fast, and we make available for your use a video projector, a large motorised screen and a flipchart to express your ideas and concepts. The comfortable chairs, as well as the work tables, can be arranged in theatre or U configuration according to your preference. We can provide you with photocopies on request, and a fax machine is available for your use. The conference room of the Grand Hotel Saint-Michel allows you to bring together 22 people if tables are required, or 35 people for a cocktail configuration, i.e. without tables. Feel free to contact our team if you wish to organise on site catering such as breakfast, lunch, or perhaps just a simple snack. In fact, at the Grand Hotel Saint-Michel, you have the possibility to create a conference à la carte, designed in accordance with your requirements! Our team is ready and willing to help ensure that your project runs smoothly. We are also available to answer any questions or requests for information. Business meetings, press conferences, brainstorming sessions, get-togethers with different teams, presentations, annual seminars; our space hosts all kinds of professional events. With its large windows and pleasant wall fresco, this room offers the perfect setting for your requirements, irrespective of the nature of your business. Arrange to have your event take place here, in the prestigious setting of our hotel, in the midst of an elegant neighbourhood. When using the facilities of the Grand Hotel Saint-Michel you will benefit from an exceptional quality of service, as confirmed by our 4 stars. Our elegant building boasts a minimalist and resolutely chic contemporary décor in which premium materials combine with designer furniture. 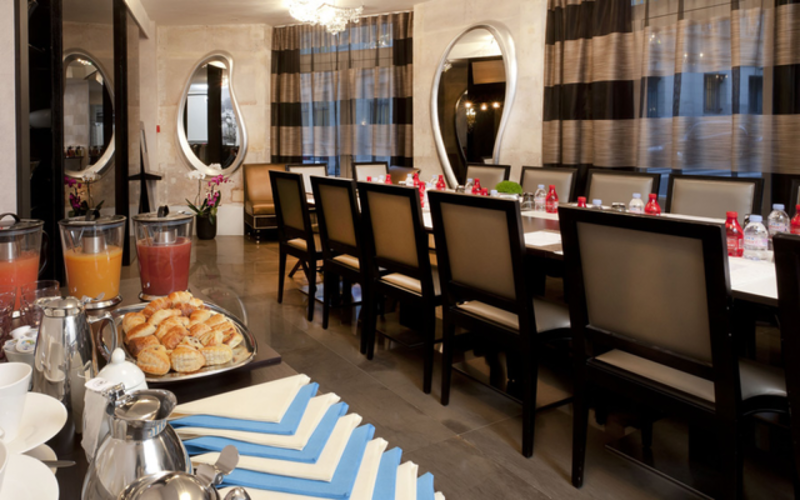 The rooms are spacious and quiet, and our guests can enjoy the assistance of an outstanding concierge service. Once your seminar is over, you’ll have the option of relaxing in our hammam and wellness area.